LSBU marked the Chinese New Year with a celebratory event organised jointly with the Confucius Institute for Traditional Chinese Medicine, the LSBU Students' Union (SU), as well as the International Office (IO) and Chinese Students and Scholars Association (CSSA). Over 150 members of staff and students joined in the cultural celebrations, as well as Vice Chancellor Professor David Phoenix and Southwark's Mayor's special representative, Councillor Althea Smith. 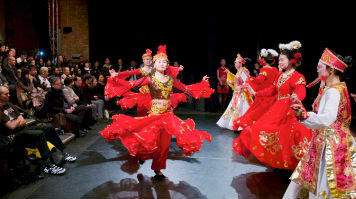 The event featured a variety of traditional Chinese cultural elements, and included a Chinese folk instrument performance, as well as a traditional folk dance and martial arts demonstration. As part of the New Year's roadshows, the celebration also presented an opportunity for students and staff at LSBU to experience the Chinese culture, as well as Chinese delicacies. The celebration also featured prize draw, won by Mr. Junjie Wen, an LSBU Accounting student. Find out more about the Confucius Institute for Traditional Chinese Medicine (CITCM).